With the side already missing Steve Smith, David Warner and Cam Bancroft due to the suspension related to the ball tampering incident, Australia look set to lose another six players to injury. Bowlers Pat Cummins, Josh Hazlewood and all-rounder Mitch Marsh haven’t played since the fourth Test in South Africa. All three are in doubt for the Pakistan series due to injury. In further bad news for the Aussies, Joe Burns, Matt Renshaw and Shaun Marsh all picked up injuries playing county cricket and remain in doubt for the Pakistan Test series. Burns and Renshaw had looked set to use the opportunity to push their claims for a Test spot. In brighter news for Australian cricket fans, Mitchell Starc look set to be fit for the Test series. Starc has been incredibly important for Australia in all forms of the game in recent seasons and will be a welcome addition to the side. Given that Australia are missing five opening batsman, Usman Khawaja should be promoted to open the batting. Khawaja averages over 200 when opening the batting at Test level. 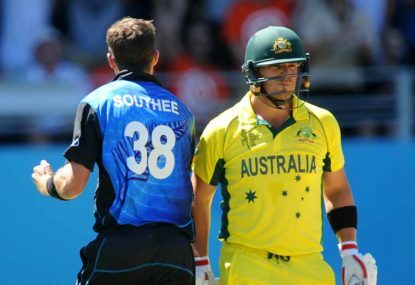 His opening partner should be Aaron Finch who is in excellent form and has a great deal of experience against spin. The middle order should consist of Callum Ferguson at 3, Peter Handscomb at 4, Glenn Maxwell at 5 and Travis Head at 6, with captain Tim Paine batting at 7. Ashton Agar and Nathan Lyon should be the spin bowling duo. While Mitch Starc and Chris Tremain should be the quicks used. Jon Holland, Jhye Richardson and Jake Doran should go as the backups.